THERE was nothing to suggest that Josh Roberts would become the tough, inspirational ball-winner that he was to become as his WAFL career started, but in reflection he's tremendously proud to be a premiership captain, life member and dual Swan Medallist at Swan Districts. Roberts came through the ranks at Swan Districts as a running half-forward or wingman, and that's where he was used in his league opportunities he received between 2002-04, but it was in 2005 when his career took off when then coach Steve Turner threw him into the middle. 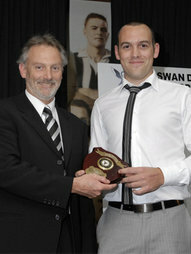 The result was that Roberts went on to amass an outstanding career with Swan Districts where he played 175 matches, won the 2008 and 2009 Swan Medals, is a life member of the club, played three times for Western Australia and of course, was the 2010 premiership captain. That is the resume befitting a great of the Swan Districts Football Club even though the 28-year-old retired perhaps prematurely at the end of 2012 that saw Swans lose the home preliminary final to East Fremantle. While his personal achievements are nice, the thing that Roberts is most proud of is the 13 finals he played including the losing 2008 grand final to Subiaco and winning premiership decider against Claremont in 2010. When Roberts began his league career back in 2002, the club's survival was in jeopardy let alone its chance to contend for a premiership but it began to turnaround in 2004 and ended up in two grand finals and two preliminary final finishes in the last five years of his career. "When I first started I thought we would have absolutely no chance of playing in a premiership, but fortunately we were able to build up over three or four years with a lot of young guys coming through and a lot of recruits that we added to the side," Roberts said. "We had a bit of luck in 2010 as well and you need a bit of luck, and we got it that year and fortunately for us we got a premiership." While the 2010 premiership when captain was obviously the highlight for Roberts, he still recalls that the 2004 first semi-final win at Subiaco Oval over South Fremantle was a massive step forward for Swans as they won their first final since a 1991 first semi-final win over Perth. "The first year we made the finals was an interesting period for the club," he said. "We hadn’t made the finals for 10 or 12 years, we had a lot of long-serving players at the club Beros, Cornelius, Edmonds and these sorts of guys who had given great service during wooden-spoon years and when we were a basket case off the field. "To go from that position in 2002 to then play finals in 2004, and win that first final and play off in a prelim was a huge moment for the club. Then that on-going success from there to play in five or six finals campaigns and go reasonably far in those campaigns, plus play in a couple of grand finals and obviously to win one was great." Roberts was always played in an outside role in the developing stages of his career, but ended up one of the most courageous and admired in-and-under players in the game over the last 10 years. He felt that role suited him in the end, but it's not something he thought of doing early on. "Our coach at the time Steve Turner really had a crack at me for a few weeks just over my effort and that was the turning point for me that I really had to put in more effort. It all sort of evolved from there. "It was purely by accident the way my game changed. I was never really an in-and-under player and I remember at the time I was in-and-out of the league side, and half-forward flank was a hard position to play," he said. "That position probably suited me a little bit more given I wasn’t overly quick as well. The last few years we've had a good mix of players with good runners, good inside players and really good key position players. You need a bit of everything to be a successful side and that's what we had." Now that he is retired and is in a position to reflect on his career, Roberts is proud of everything he accomplished individually and with the team. "I'm proud of what we achieved as a team and what I was able to achieve individually. You look at the positives, but always think to yourself as well that you could have done a bit more early on and I might have been in even more of a different position if I had done that," he said. "There's no point having regrets, though, and I'm happy and proud of what I achieved individually and as a team. I certainly don’t consider myself on the same lines as a lot of the greats at Swan Districts, I was just a solid contributor who was lucky enough to pick up a few accolades along the way." 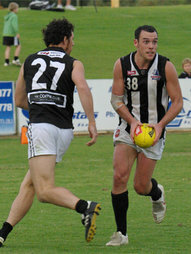 Roberts played for WA three times in 2007 against Victoria, 2010 against Victoria and 2012 against South Australia. While Roberts was never given a huge amount of ground time and all three were losses, he was at least glad to play for WA. "It would have been nice to get to play in a winning side as well, but unfortunately it wasn’t the case," Roberts said. "It was great to be part of those state sides, but personally I never really played too well in those games and that's one thing I look back on and wish I could have contributed a bit more in those." When Roberts started his league career at Swan Districts back in 2002 times were tough, but he had plenty of senior players he quickly found himself admiring at the club and will never forget the influence they ended up having on his career. "When you are growing up and just coming through you always notice and look at the more senior players. I always looked up to Adam Lange, Brady Anderson, Shane Beros and Joel Cornelius," he said. "It's more about just noticing what they are doing, the care they have for the club and the effort that they put in with the way they prepare. "Each year there are guys you love playing with, though, and over the last few years I've loved playing with guys like Tim Geappen, Tallan Ames, Tom Roach and the list goes on and on. The relationships formed over the years have been good." 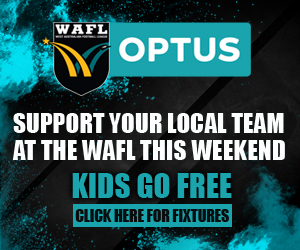 As for opponents, there were players at each club that stood out that gave Roberts some sleepless nights but Claremont's' Luke Blackwell, West Perth's Jason Salecic and South Fremantle's Toby McGrath were right at the top of the list. "Each club had a really dominant midfielder so it was always a bit nerve-racking playing against Luke Blackwell, Jason Salecic, Toby McGrath and those sorts of guys. Each club has got one or two of those sorts of players."